Eastern Christendom, already wracked by divisions, was dealt a severe blow by the invasion of the Persians in 612. In 614, the Persians captured Jerusalem, destroying the church of Holy Sepulcher and carrying away the relic of the True Cross. In 619, the Persians conquered Egypt. In 626, Constantinople itself was besieged by the Persians and their allies. Emperor Heracles, in a bold move, invaded Persia itself and, in 627, defeated it, ending the war. Muslim Arabs invaded the Roman and Persian empires in 634. Both empires were exhausted after the long and brutal wars. The Monophysites, who were persecuted by Constantinople, considered the Muslim conquerors to be liberators. Within a century, Muslim armies had conquered Syria, Egypt, North Africa, and Spain. The core of the Christian world was lost. Disputes over Christology remained in the conquered territories, yet they were removed from the political sphere because Muslim rulers had no interest in the distinctions. Christianity, which had spanned the entire length of the Roman Empire, was shrinking rapidly. Of the five patriarchal sees only two remained: Rome and Constantinople. In the Middle Ages, Eastern and Western Christendom would cluster around these two poles—the Roman Catholic and Greek Orthodox worlds. 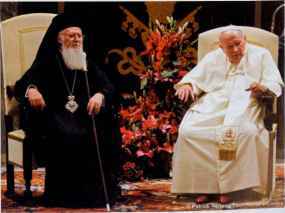 Pope John Paul II talked with Greek Orthodox Ecumenical Patriarch Bartholomew I after a private audience at the Vatican on June 29, 2004.